In Loving Memory of / Hiram / the beloved husband of / Emma Brook / who died August 19th 1914 / Aged 50 years / He died in Peace. 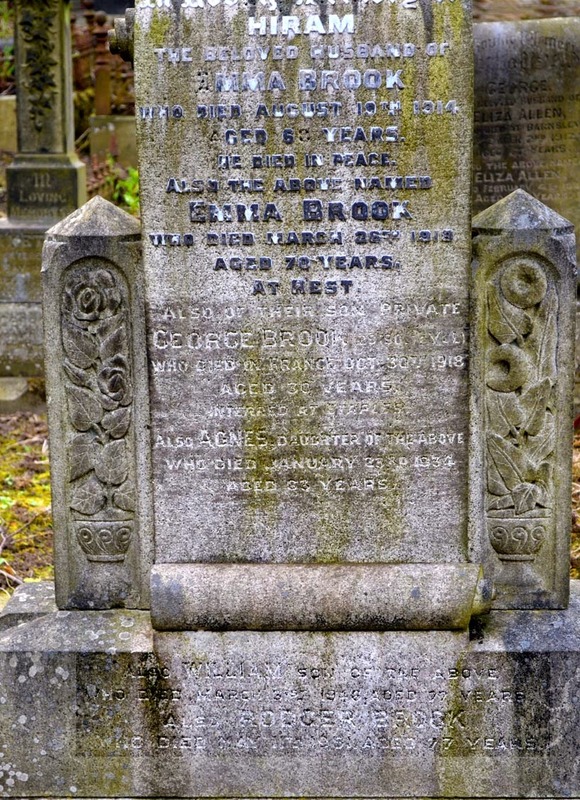 / Also the above named / Emma Brook / who died March 28th 1918 / Aged 78 years / At Rest. / Also of their son Private / George Brook 29190 Y&L / who died in France Oct 30th 1918 / Aged 30 years / Interred at Etaples / Also Agnes daughter of the above / who died January 23rd 1934 / Aged 63 years / Also William son of the above / who died March 3rd 1946 aged 77 years / Also Rodger Brook who died May 17th 1981 aged 77 years. Read more about George on the Silkstone Remembers website. George is also remembered on the Silkstone War Memorial, the Thurgoland War Memorial, on the WW1 Roll of Honour and Memorial Plaque in Holy Trinity Church, Thurgoland and on the Hood Green War Memorial. He is buried in Etaples Military Cemetery in France and commemorated on the Commonwealth War Graves Commission website where his next of kin is given as his brother William Brook of Thurgoland.